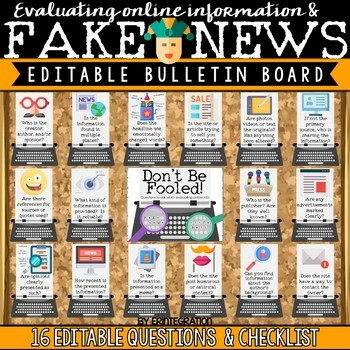 Teach students to ask critical questions about information online and spot fake news with this editable bulletin board set. 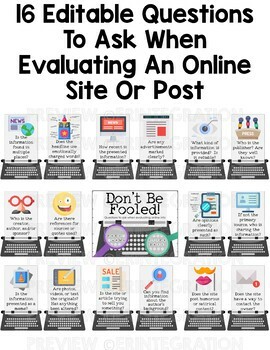 These 16 EDITABLE specific questions will help students evaluate information online by focusing on the currency, authority, reliability and purpose of the site or news. 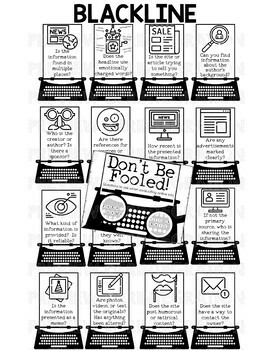 This editable bulletin board set would work great in Spring for an April Fool's Day theme or an all year digital citizenship bulletin board for the technology lab or classroom! 16 posters are included in both color and BLACKLINE or use the EDITABLE PowerPoint file to add your own wording! 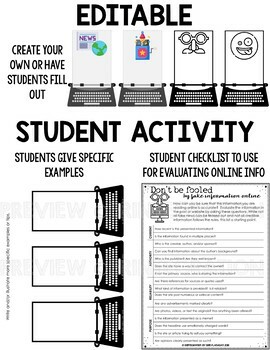 Also includes a sign, student sheet with each question to print and use and blank templates for students to add their own examples. ★ 16 posters in color & blackline. ★ Sign in color & blackline. ★ Blank sets to print and have students add tips and/or examples. ★ Editable PowerPoint to add your own tips to the templates. Tip posters measure approximately 4 x 5.5 inches when printed as-is. This can easily be adjusted smaller when printing. More Technology Themed Classroom Decor.